and runs for four days. 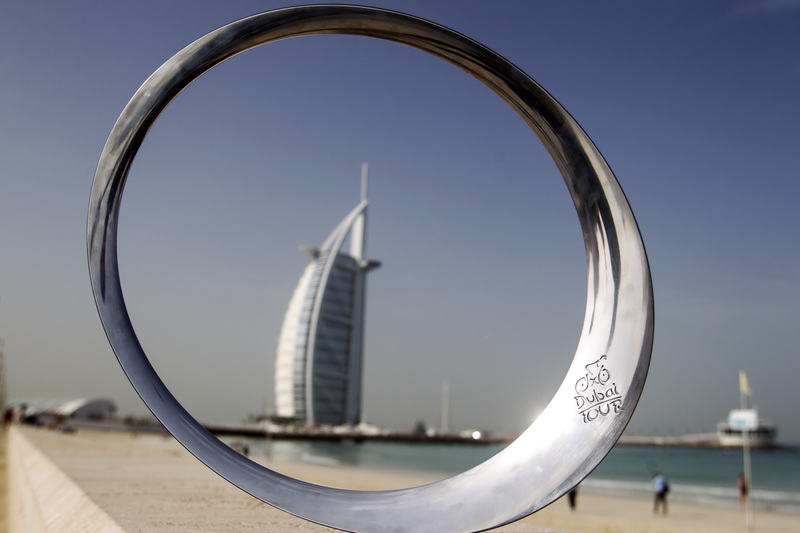 The Dubai Tour winner "Circle of Stars" by Pininfarina. Saeed Hareb, Chairman of the Dubai Tour higher Committee "When we received the proposal for the Dubai Tour, we said, 'Why not?' After all, Dubai hosts many world class events, and cycling would be a prestigious addition to the list. Dubai has a long tradition of organising major events, and the Dubai Tour is one more sign that the world trusts Dubai." Mark Cavendish, former World Champion: "It's exciting to have Mark Renshaw and Alessandro Petacchi riding for me. Together with Tony Martin, they make a formidable train. Hopefully Tony Martin will win the time trial, then there should be three sprint stages. With a strong and motivated team, we'll be targeting all of them." Vincenzo Nibali, reigning Giro d'Italia champion: "Dubai is a new territory for professional cycling. Sagan is here, Cancellara is here: the big names. So from Day One, the Dubai Tour looks like it is a great success. I have had a few days rest at home after an small accident I had in Argentina. I'm here looking for rhythm. there is a time trial, where I will try to do well, and otherwise it is a race for sprinters, and we have two in Guarnieri and Guardini." Alberto Rui Costa, reigning World Champion: "This is my first time in Dubai. I really wanted to get to know the place. It is very different to what I'm used to. The race doesn't really suit my characteristics, but I'll take any opportunity that arises." Marcel Kittel: "I've already been here a few days, and I've really enjoyed myself so far. I was surprised to find so many cyclists. They have taken us around and shown us the training routes, The Dubai skyline is amazing when you see it form the desert! I don't think that sprint finishes are guaranteed: there is plenty of wind out there, and it could dictate otherwise." Fabian Cancellara, four times the World TIme Trial Champion: "It is important to promote cycling, not just as a sport but as a healthy activity. Many of my colleagues have already been competing in sunny Australia and Argentina. I've been in Switzerland all this time, so it is good to come here and ride in the heat." Tony Martin, three-times and reigning World Time Trial Champion: "I've come here to try to win this race, although it isn't going to be simple: the crosswinds could play a decisive role, and first, I'll have to ride a really good time trial." José Joaquin Rodríguez, World No. 1 rider: "It's not really a race for climbers like me, and none of us are riding at 100% yet, but coming to this wonderful location is perfect for moving a little closer to top form, in this great weather." Alejandro Valverde: "I've come here, in part, to get to know Dubai, and because it is important to spread professional cycling around the world, especially in such fascinating places. I've also come to enjoy riding on good roads and in good weather." Yousef Mohamed Mirza, United Arab Emirates national team captain: "Over the last two years, cycling has really grown here. The government has seen what is happening in cycling, and has provided us with support. For the United Arab Emirates national team, this is a journey into the unknown. We really don't know how we will do: but riding with the professionals will be a wonderful learning experience."